Are you nervous or anxious about going to confession? Don’t be! 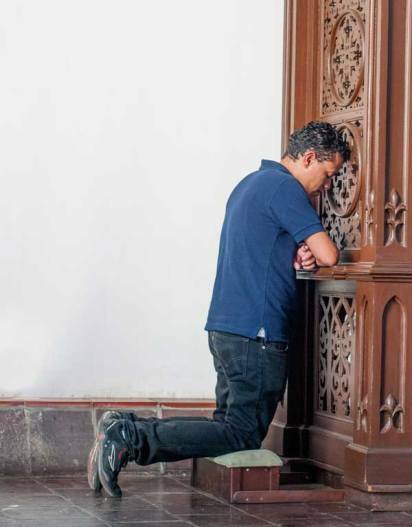 Prayers before Confession (also known as the Sacrament of Penance or the Sacrament of Reconciliation) can put you in the best frame of mind to unburden yourself of your sins when you go into the confessional. We have some selections we hope might help, including a prayer from St. Jerome and one from St. Gemma Galgani. This prayer appeals for Heavenly assistance and this one asks for Jesus’ help directly in making a good confession. (Remember, as our Lord told his disciples once in John’s Gospel (15:5) “I am the vine you are the branches…. without me you can do nothing .”). We also wish to offer these short prayers on our Aspirations page and these prayers below you can say before Confession as well. This first one asks for the help of the Holy Spirit in being able to discern our sins and to feel genuinely sorry for them. O Holy Spirit. Source of all light, Spirit of wisdom, of understanding, and of knowledge, come to my assistance and enable me to make a good confession. Enlighten me, and help me now to know my sins as one day I shall be force to recognize them before Thy judgment seat. Bring to my mind the evil which I have done and the good which I have neglected. Permit me not to be blinded by self-love. Grant me, moreover, heartfelt sorrow for my transgressions, and the grace of a sincere confession, so that I may be forgiven and admitted into Thy friendship. This next prayer was written by the great 18th Century Saint Alphonsus Liguori, one of the Doctors of the Church (those saints recognized for their exemplary holiness and significant teachings) who authored many books about our faith. O my God, help me to make a good confession. Mary, my dearest Mother, pray to Jesus for me. Help me to examine my conscience, enable me to obtain true sorrow for my sins, and beg for me the grace rather to die than to offend God again. Lord Jesus, light of our souls, who enlightens every man coming into this world, enlighten my conscience and my heart by Thy Holy Spirit, so that I may perceive all that is displeasing to Thy divine majesty and may expiate it by humble confession, true contrition, and sincere repentance. Our Lord, through the priest acting in His name, wants to help you advance in grace and forgive you through your confession! Jesus Himself charged His apostles, and by extension, His church with administering this Sacrament when He appeared to them after His resurrection as we read in John 20:23. The priest is there to give you guidance, along with God’s grace in absolution, through his advice and insights. Prepare yourself as best you can to confess whatever mortal sins you may have committed since your last confession, recalling to mind any venial ones as well. Although you are not required to confess venial sins to a priest, it’s a good idea to do so nonetheless to strengthen your relationship with our Lord. After examining your conscience, prayer can also help you prepare. But don’t feel you need to use any particular prayers, such as the ones we’ve given here, as a “formula”. You can also pray to our Lord in your own words. Ask God for the grace of true contrition for your sins and a firm determination not to commit them again. This doesn’t mean you won’t sin again, but without God’s graces, avoiding sin becomes much harder. It is important to keep in mind as well that in confessing our sins to another human being rather than just to God in private we are exercising the virtue of humility, an essential component of holiness in God’s eyes. And whatever you say in the confessional stays there! Under what is known as the Seal of Confession a priest may not reveal what you tell him to anyone under penalty of excommunication! Remember in any case, that as St. Dominic Savio once said “The confessor is the doctor of the soul.” And what did Jesus once says about sinners in this regard? “It is not the healthy who need a physician, but they who are sick, I have not come to call the just, but sinners, to repentance” (Luke 5:31-32).